The U.S. Department of Agriculture (USDA) invites public comments on the proposed rule to establish the National Bioengineered Food Disclosure Standard mandated by Congress in 2016. The standard will provide a uniform way to offer meaningful disclosure for consumers who want more information about their food and avoid a patchwork system of state or private labels that could be confusing for consumers and would likely drive up food costs. The National Bioengineered Food Disclosure Standard Law was enacted by Congress on July 29, 2016. Agriculture Secretary Sonny Perdue said, "This rulemaking presents several possible ways to determine what foods will be covered by the final rule and what the disclosure will include and look like." He added that they are looking for public input on a number of these key decisions before a final rule is issued later this year. 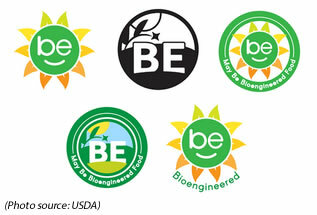 The USDA proposed a variety of labels containing the abbreviation BE standing for "bioengineered", as well as sun and smiley face icons. The companies may opt to use QR codes as well. The proposed rule is open for comment for 60 days, and will end on July 3, 2018. Due to the Congressionally mandated timeline for this rulemaking, the comment period will not be extended. For more information, and for details on submitting comments, read the USDA press release. The proposed rule can be previewed in the May 3 Federal Register.